$15 - Splendid will make sure you're little girl feels like she's being pulled into a comforting hug every time she wears their tank. The heather gray knit fabric is as soft as a kitten's fur, and fits like a glove. This tank is sure to become an instant favorite in her wardrobe as it feels feather light and pairs with virtually every item in her wardrobe! 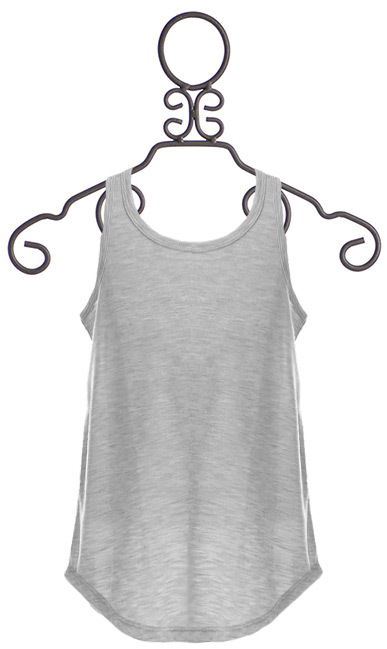 Perfect for layering, this tank can easily be worn beneath sweaters and loose tops for modesty or even comfort. Wear with skinny jeans and boots under a jacket or cardigan sweater, or wear with a sweet pair of patterned shorts to play outside in the summer for an effortlessly beautiful ensemble no matter what season.